Like the full-size version, the Rock Crawler Jr. has two motors with geared-down transmissions to supply a lot of torque, while sacrificing speed. The idea of all rock crawlers is to climb over obstacles slow & steady, rather than trying to plow through too quickly and ending up getting stuck. This strategy works well, as the truck does crawl over rocks that no other toy-grade RC of this size can, and it does it with ease. The terrain that will stop the Rock Crawler Jr. is something exceedingly steep, or rocks more than half the height of the entire vehicle. The one thing that isn't so great on this truck is the steering. It responds quickly to your controls, but it just doesn't steer very sharply, especially when going forward, so you have a pretty large turning radius. It turns better in reverse, so if you run out of room to make a turn, you can do a "multi-point turn" by alternating forward & back, steering the opposite way when in reverse, and after a few tries you'll be pointed in the desired direction. 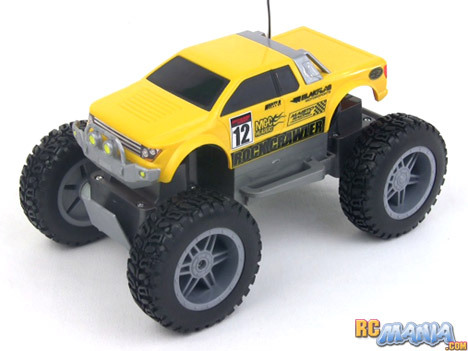 The Maisto Tech Rock Crawler Jr. takes the great design and performance of the larger original Rock Crawler and brings it down to a smaller size that's more accessible to younger kids. Because of this smaller size and appropriately reduced speed, it's also even safer for kids to use indoors, less likely to cause accidental harm to its environment. Right after I finished my testing of the Rock Crawler	Jr.,	I	gave it away to a 5-year-old who proceeded to drive it around endlessly with bright eyes, a big smile and a lot of imaginative play scenarios. As mentioned earlier, the steering mechanism could be improved on this truck, but even with this small shortcoming, it's still a great value.